Uncomfortably mashes a heist, romance, and comedy into one bloated, subpar experience. I admit I had low expectations after watching the trailer for Finding Steve McQueen, mostly because it looked a little cheesy and I’m not big on heist movies. Set in 1972, it revolves around a gang of robbers attempting to steal $30 million in dodgy money from President Richard Nixon’s secret stash. Even after watching the finished product, perhaps my already low expectations were still too high, as the trailer was far more entertaining. Directed by Mark Steven Johnson (Killing Season, When In Rome), the film ended up being half a subpar heist film, half a subpar romance with a little comedy thrown in for good measure. At least I think it tried, though I didn’t laugh. 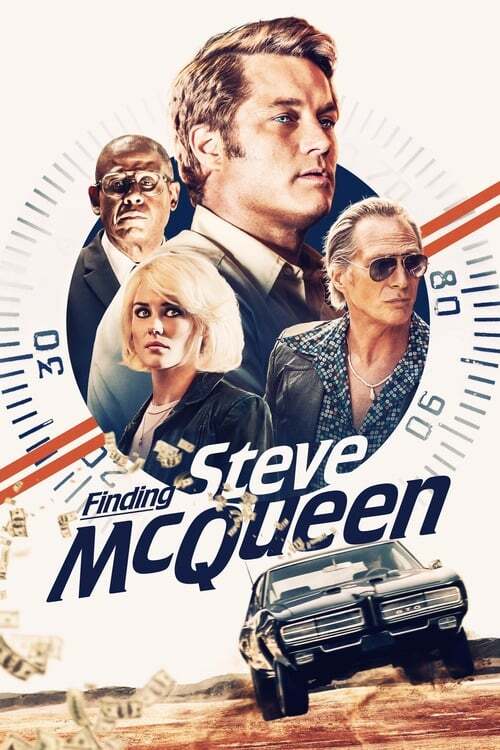 Inspired by (mostly) true events, Finding Steve McQueen starts in 1980, Deerwood, Pennsylvania, with Harry Barber (Travis Fimmel) meeting with his long term girlfriend Molly Murphy (Rachael Taylor) in a diner. He confesses to her that he’s not who she thinks he is and has been hiding from the FBI ever since they met. The reason for his lies? He was involved in “the greatest heist in American history”, a robbery involving a bank in California where former President Nixon was supposed to be keeping $30 million in illegal funds. Harry confesses to Molly all the details of the robbery by telling the story of how it all went down 8 years ago – including how he fell in love with her after the deed was done. I won’t delve more into the story as it’s so wafer thin I’d spoil what few plot points exist. First, it’s not a particularly interesting robbery. Only the contents of the bank and the massive FBI interest afterwards are what gives this story any sort of reason to be told. That’s probably why half the film is a flashback to how Harry and Molly met because there really isn’t that much more to tell. The robbery is so uneventful that it was carried out over the course of multiple days – the bank was robbed while it closed for the weekend. The only real hiccup our antiheroes faced was was running out of time before they could steal everything they wanted. Nobody was shot. Nobody walked in on them. Nobody set off the alarm. They were able to get inside and steal a lot of money without being bothered. Yawn. The acting is a bit of a mess. Travis Fimmel’s “goofy and I’m trying to be funny” portrayal of Harry Barber puts him at odds with the vibe the rest of the film is attempting. He really stands out and seems out of place whenever other characters are portrayed in a less over-the-top manner. When you have Forest Whitaker taking a serious approach to his portrayal of Howard Lambert, the police officer initially tasked with tracking down the bank robbers before the FBI gets involved, it’s hard not to find Travis Fimmel’s performance annoying. In the middle of the performance spectrum between Fimmel and Whitaker you have the rest of the cast, who weren’t anything special. Rachael Taylor is probably the most convincing as a woman being shocked at the discovery her boyfriend of 8 years has been lying to her and is a wanted criminal. But given that so many of her scenes are directly opposite Fimmel, it’s hard for her to really salvage those moments. William Fichtner is particularly woeful playing Enzo Rotella, Harry Barber’s uncle and leader of the group. He tries so hard to be an Italian gangsta that he comes across as an actor trying to act like an Italian gangsta. There’s going to be no awards for acting for this film. Even though I question whether Mark Steven Johnson turned up to set to provide any kind of direction to the actors, I will say he’s done a reasonable job recreating an authentic 1970s vibe. Other than some terrible blue screening in parts, you do feel transported to the decade of suede and disco balls, perhaps overdone to drive the point home that Harry Barber desperately wants to be as cool as the iconic Steve McQueen. Finding Steve McQueen is a strange experience that tries to mash two stories – a heist and a love story – into a comedy that doesn’t work. It’s not thrilling, it’s hardly romantic, and it’s certainly not that funny. It’s a mess. With actors taking different approaches to performance seriousness and a story that tries to squeeze what little there is to create a compelling narrative, it’s an underwhelming experience I wouldn’t wish on anyone. Even worse, you’d think a movie that namechecks an actor so effortlessly cool and likable as the real McQueen would have the sense to follow that lead a little better. Save yourself the trouble and watch any of his movies instead.